Director-General Mark Thompson grilled by MSPs on independence and job cuts. Taking part in "scenario planning" for how the BBC could be funded and run in an independent Scotland would endanger the organisation's impartiality in the lead-up to the referendum, its director-general has told MSPs. Mark Thompson told Holyrood's Culture Committee that any comment from the organisation on the scenarios which might arise for broadcasting in the event of constitutional change would open it up to accusations of bias. The committee was told that the BBC currently collects £300m in licence fee money north of the border, with £200m of that being spent in Scotland on Scottish services, network television for the whole of UK, overheads and infrastructure. The remaining £100m is Scottish licence fee payers' contribution to all of the other services the broadcaster provides, such as its online iPlayer or coverage of events such as the World Cup or the Olympic Games. Labour MSP Neil Bibby asked Mr Thompson, who was joined by BBC Scotland director Ken MacQuarrie and chief operating officer Bruce Malcolm at the committee, if the £300m would be enough to fund the current level of service from the BBC if Scotland were to become independent. Mr Thompson said: "To answer that question properly, somebody would have to do something that the BBC hasn't done, which is, in a sense, do a zero-based budget from scratch and work out how much it would cost to acquire such a portfolio of services in a different way. "That's not something we have looked at. To be honest, the issues of what if, and how you could spend that money, is something you'd need to do separate research on." He added: "The most important job the BBC have got to do over this period - and it's probably the most important job we've ever had to do in Scotland - is to be a platform on which the momentous political decisions of this coming period can be fairly and impartially discussed and debated. We don't want to get involved in anything which might colour our role as an independent platform." Labour's Neil Findlay pressed Mr Thompson further, saying: "I'm quite astonished that there hasn't been any discussion with such a significant institution in the life of Scotland as to what the future of broadcasting and public service broadcasting might be should there be constitutional change." Mr Thompson insisted the BBC would not be drawn into "scenario planning" and it would be "very easy for that to be portrayed as some sense of bias". He said: "If we were to start confusing a corporate interest, people would quite reasonably say, 'well, hang on, how can you get involved in that while at the same time be an impartial journalistic observer and platform as the debate takes place? "I take a very austere view of this, which is that our job is making sure we report events in Scotland and give the Scottish public the best possible chance of hearing a fair debate without getting drawn into scenario planning about what happens specifically to the BBC, or broadcasting more generally." Mr Thompson also faced a series of questions from committee members on possible job cuts at BBC Scotland as a result of budget reductions. The broadcaster could cut up to 120 jobs at BBC Scotland by 2017 in a push to reduce its budget by 16%. The proposals are part of the organisation's Delivering Quality First scheme, which has now been rubber-stamped by the BBC Trust. The BBC has committed itself to saving billions of pounds from its budget after the annual licence fee was frozen at £145.50 for six years. Mr Thompson insisted BBC Radio Scotland was being "very strongly protected" while reports that Radio Four's Today programme was not facing the budget reductions were "misleading and wrong". He said: "The efficiency targets we're looking for from Radio Four are very comparable with those we're looking for from BBC Radio Scotland. "They're slightly lower but it's just over 11% rather than 13%. It's a myth that there is an enormous chasm between the way we are approaching Radio Four and the way we are approaching Radio Scotland. 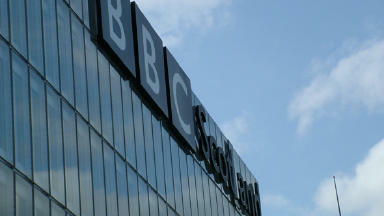 Radio Scotland is also being very strongly protected." Committee convenor Stewart Maxwell said it had been reported that the budget of Radio Scotland's Good Morning Scotland (GMS) programme was equivalent to the salary of presenter Jeremy Paxman. Mr Maxwell asked Mr Thompson if he had considered 10% salary cuts for "individual senior very expensive" staff, instead of programming such as GMS. Mr Thompson said the GMS budget was very substantially higher that Mr Paxman's salary, although he refused to discuss the price of individual programmes. He said: "You'll know that we have been reducing the amount of money spent on senior presenters very significantly in recent years."